"The Anthem MRX 510 AV receiver does not offer an extensive list of features like some of the other AV receviers out there today. Instead what it offers is a musical soul that is unlike any other, which can give you goose bumps while listening to music and total immersion when watching movies. When researching AV receivers, do yourself a great faavour, and make sure to listen to one of these new Anthem MRX models. Once you discover their sound performance, you'll almost certainly want to bring one home. Remember there are three models to choose from, for all room and pocket sizes. The MRX 510 gets my highest level of recommendation which goes hand in hand with the CANADA HiFi Editor's Choice award." Click here! 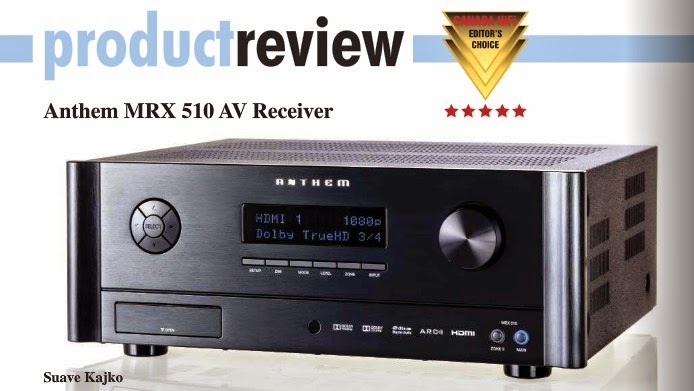 to read the full MRX 510 review from Canada HiFi. Anthem's MRX 710 is a Canada HiFi cover girl!